With the advantages of price and what it brings to us, Optoma H183X is surely a wonderful procduct that is suitable for your livingroom. 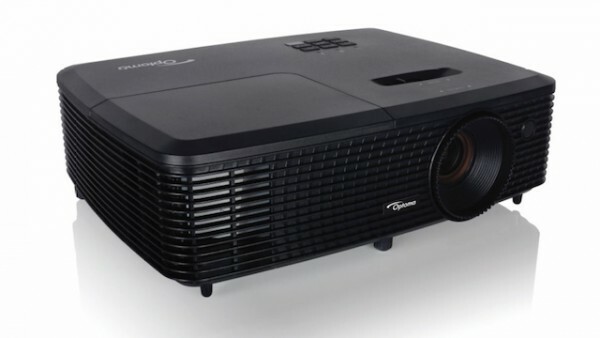 Optoma H183X is a very affordable H183X HD Ready projector. If you are a sports fan, the Optoma H183X would be a great product for you to enjoy each action on a big screen clearly. If you are not a sports fan, do not worry, Optoma H183X will also bring a great experience for videogames and movies. WHAT IS THE OPTOMA H183X? For £300, the H183X is an ultra-affordable HD Ready projector, with its eyes firmly set on taking up residence in the living rooms of sports fans across Britain with the upcoming Euro football tournament and Olympic games. Although it turns out that it could serve video game and moviefans very nicely too. With its fairy standard rectangular footprint, matte-black finish, flat top and grilled sides, the H183X is unlikely to find its way onto the pages of Vogue’s projector edition. It does, however, feel surprisingly robust and heavy for such an extraordinarily cheap projector. Connectivity is a little underwhelming, chiefly because you get only a single HDMI input. In truth, though, a projector such as the H183X is likely to be kept in a cupboard for much of the time and brought out only for special occasions. In that sort of relatively casual environment, a single HDMI for a single source will likely be sufficient. Joining the HDMI is a D-SUB VGA port, a composite video port, 3.5mm audio input/output jacks, and an RS-232C port to aid system integration. It&apos;s also possible to stream video to the projector wirelessly, on spending an additional £190 or so for Optoma’s WHD200 wireless video kit. The Optoma H183X’s picture specifications don’t get off to a great start, as a result of the native resolution of its single-chip DLP optical system not being full HD; instead it’s an "HD Ready" WXGA 1,280 x 800. In addition, this resolution equates to a 16:10 aspect ratio rather than the 16:9 ratio suited to widescreen video sources. It turns out, however, that the projector can still presents 16:9 sources in their correct ratio, rather than stretching them slightly vertically as some 16:10 projectors have done in years gone by. Also, while it isn&apos;t completely unheard of to find projectors at the Optoma H183X’s insanely low price level to feature Full HD resolutions, I can’t think of a single model that offers such video-friendly accompanying specifications. My eye was quickly caught by a claimed contrast ratio of 25,000:1, which is way higher than you’d usually find at this price. The colour wheel, too, has apparently been optimised to deliver video accurately to the Rec 709 standard still used by most HD and standard definition sources; the HDR feeds now available on some Amazon and Netflix HD streams are understandably not supported. The Optoma H183X’s claimed maximum brightness of 3,200 lumens is eye-catchingly high for such an affordable and portable projector. On paper, this is easily enough to support viewing in a decent amount of ambient light. Which will, of course, be ideal for those occasions you have your mates round on an afternoon to catch one of the upcoming Euro 2016 footie matches. A trio of other features worth noting are the H183X’s built-in 2W speaker, its unusually high claimed maximum lamp life of 8,000 hours if using Eco+ mode, and its support for 3D playback. I couldn’t test the latter, however, since no 3D glasses are included with the projector. Relatively casual projectors, likely to live their lives in and out of cupboards, really need to be easy to set up. For the most part, the H183X doesn’t disappoint in this respect. Its simple zoom and focus rings, keystone correction and dropdown legs should make getting a picture up and running on your wall or screen just a minute or two’s work. There are, however, a couple of limitations. First, not surprisingly, there’s no optical vertical image shifting available, meaning most people will have to rely on the keystone correction system to get the sides of their images parallel – even though keystone correction is essentially a distortion of the image’s native pixel setup. Second, optical zoom is extremely limited at only 1.1x. This could create a few placement issues if you’re trying to use it to fill a specific screen area, rather than a less-defined wall space. Considering how cheap it is, the Optoma H183X’s menus are pretty well equipped with picture set-up options. These include a selection of gamma presets (some labelled according to content, some numbered) and a surprisingly full colour-management system that includes hue, saturation and gain tweaks for the red, green, blue, magenta, cyan, yellow and even white components. There&apos;s also a suite of different lamp modes, including two dynamic options that adjust the light output according to the image content. There are 10 settings for Texas Instruments&apos; BrilliantColor system for boosting colour saturations and a useful selection of themed picture presets that include Game and Cinema options. The most important settings I’d recommend you play with are the lamp mode and the BrilliantColor feature. I found that the dynamic and Eco+ lamp modes – which adjust the light output to suit the images being shown – achieve the best all-round picture quality, since they boost the perception of black level response and the punch of bright scenes and image elements. It is also in Eco+ mode that the projector’s lamp life will be maximised. However, if you run the BrilliantColor setting on its default maximum 10 level with the dynamic or Eco+ lamp mode, it causes some distracting flaring out/glowing issues in bright image areas such as explosions and light reflections on faces. Fortunately, this issue can be rectified by reducing the BrilliantColor setting to around its three or two level. Obviously, in an ideal world, those who have a preference for punchier colours would be able to keep BrilliantColor at a higher setting without having to suffer such glaring peak white problems.